Vintage McCall pattern and transfer for girls smocked dress and bonnet. Dress has smocking on front and on sleeves as well. Floppy brim bonnet ties under chin. Child's Size 2; Breast 21; Waist 30. Pattern is complete. 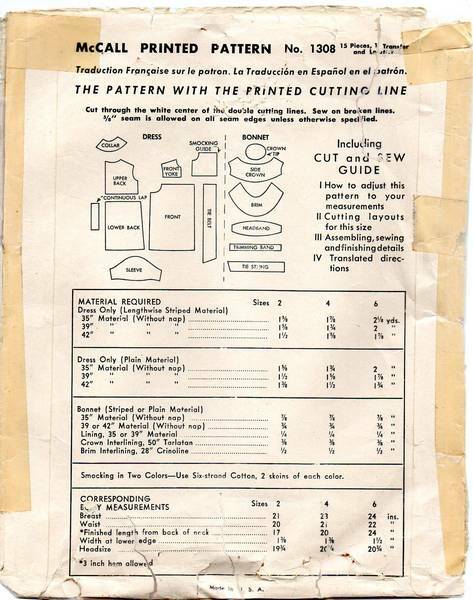 Pattern pieces and instructions are in very good condition. Transfers for the smocking are present; partially used. Envelope is in poor condition; older and newer tape mends as shown.